Time and time again, parents who don’t have access to The Lunch MOB have asked: What can we do to help ensure our kids are getting the best school meal program? Whether you are living in another city or state where The Lunch MOB is unavailable, or we simply haven’t on-boarded your school just yet, there are plenty of things you can do to engage with your kids’ schools. How do I find out what is being served in my child’s school cafeteria? Review the cafeteria menu with your child. Menus often list alternate choices, such as entrée salads and sandwiches, available to students who don’t care for the daily special. Ask your child about the fruit and vegetable choices offered alongside each meal and encourage them to try new menu items. Visit your school district website for more details. Many school nutrition departments have a web page listing ingredients, nutritional facts, allergen information and more. Have lunch with your child in the school cafeteria. Check with the principal or cafeteria manager first regarding visitor policies. See for yourself how school meals look, smell and taste. Be sure to ask questions about how the food was prepared—you may be surprised to learn that many of the traditional favorites are now made with whole grains, less fat and sodium. Who should I contact with questions/concerns about the school cafeteria menu? 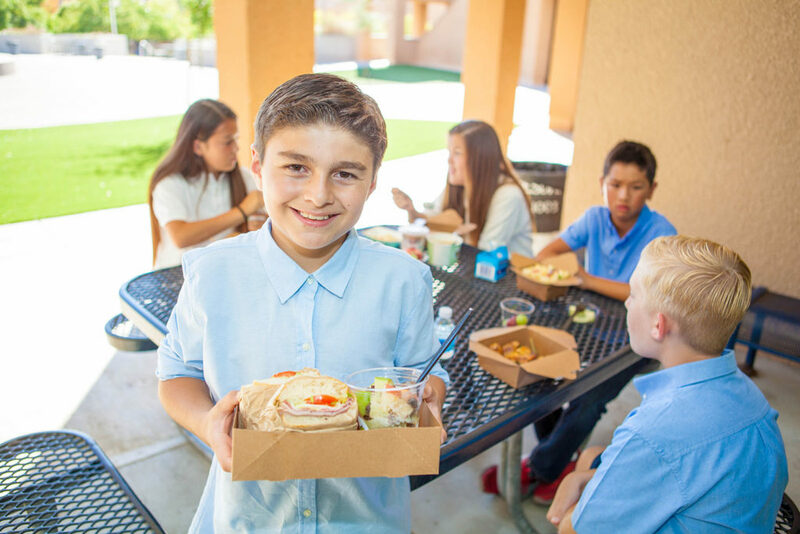 For information about menu items, contact the school cafeteria manager, who can discuss everything from meal preparation methods to waiting time in line. For more detailed questions, the cafeteria manager may refer you to the nutrition director who oversees cafeteria operations, procurement and menu planning for the entire school district. In most cases, the cafeteria manager and nutrition director do not manage vending machines or snack bars located outside the cafeteria. Contact your school principal for more information on these food choices. The principal can also address concerns about the lunch period schedule. Don’t forget to ask your teacher about classroom policies regarding food rewards and items served during classroom parties. How can I get involved in my child’s school meal program? Ask the cafeteria manager and principal about volunteer opportunities in your school cafeteria or school garden. Some schools request parent volunteers to help usher students through the lunch line and encourage them to try their fruits and vegetables. Many school districts have a wellness committee comprised of community volunteers to help establish and update district nutrition and physical activity policies. These local wellness policies can impact everything from the choices available in vending machines to the amount of time each week for PE. My child has food allergies. Do school cafeterias accommodate special dietary requirements such as gluten or nut free? If your student has a life-threatening food allergy, it is important to build a team of key individuals at school who can help safely manage your child’s needs. Start by contacting your school nurse before the first day of school to discuss implementing an allergy action plan. The school nurse can work with parents and health care providers to develop a health care plan to meet the unique needs of each student. The school nurse can also assist with outreach to teachers, coaches, school nutrition, transportation and maintenance staff and others to discuss dietary restrictions and methods for safely managing your child’s food allergy at school. School cafeterias must provide food substitutions for students whose food allergies constitute a “disability.” The student must provide a statement, signed by a licensed physician, which identifies the disability, explains why the disability restricts the child’s diet, and lists the foods to be omitted from the child’s diet and recommendations for alternate foods. Click here for more information. Even if your child’s food allergy does not constitute a “disability,” contact your school cafeteria manager to discuss the school menu and safe food choices available for your child. Your cafeteria might offer alternate choices that are not listed on the monthly menu.